“Bathing in the rain” – a Charity Bath Walk! On Saturday the 13th of May 2017, after weeks of unusually dry weather, the day of our Charity Bath Walk arrived… and so did the rain! 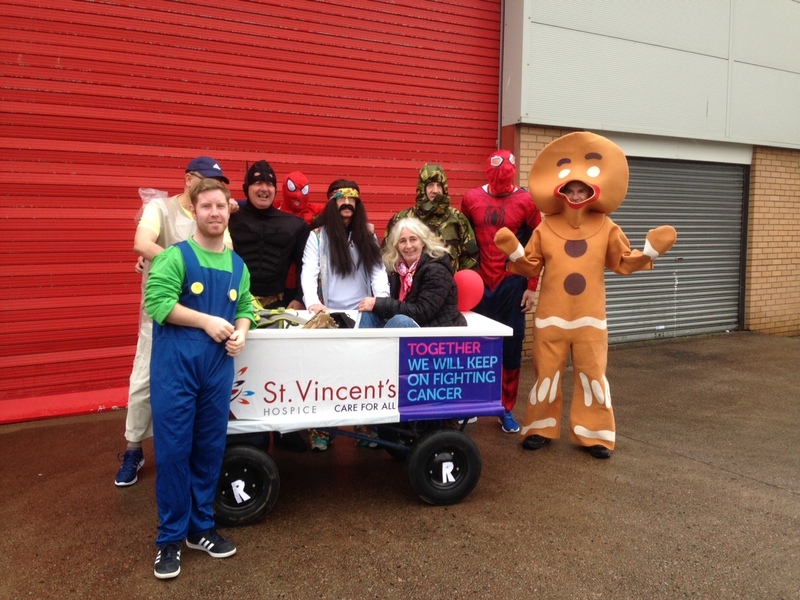 Undeterred, members of our Paisley Branch braved the elements to take part in a Charity Bath Walk. The challenge? To walk a bath (on wheels!) around a 15 mile route in Paisley. Of course, the team rose to the challenge in suitable attire – fancy dress! Despite the rain, it was a brilliant day and the team received amazing support from local people, customers and businesses along the route. We raised over £1,400 for two charities: St Vincent’s Hospice and Cancer Research UK. St Vincent’s Hospice is a charity local to our Paisley Branch which offers specialised care to people affected by life-limiting illness. The Hospice provides care in its eight beds, a day hospice and in people’s own homes. We are delighted to be able to support both deserving charities. A fantastic effort by all staff involved!